4.5 to 5.5mm semi set engagement ring setting for .50 carat round diamond (center stone not included) with .50 cttw diamond accents. Optional matching wedding band. Featuring two 3.5mm gemstones set in box shaped settings with a diamond accent on each in a trillion shaped setting. 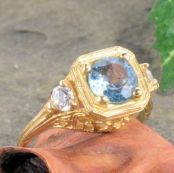 Choice of amethyst, cubic zirconia, garnet, sapphire, blue topaz or peridot. 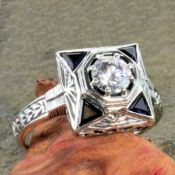 Featuring a .50 carat cubic zirconia with genuine trillion cut sapphire accents in a highly detailed embossed setting. Choice of amethyst, cubic zirconia, garnet or sapphire with diamond accents on a wheat patterned band. 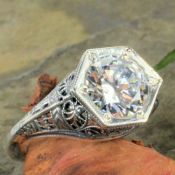 7.0 to 8.0mm semi set engagement ring for 1.50 carat round diamond (center stone not included) with pave' diamond accents. Optional matching wedding band. 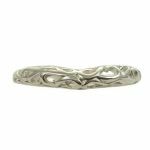 An antique style 3.0mm wide embossed scroll pattern on a curved wedding band. The embossed pattern is applied along the side with a millgrain detailed edging. Fits a 9.0mm to 9.5mm round stone or approx. 2.75 carat diamond (stone not included in price but available as an optional purchase). Cast per order using molds of the original hand carved die. An antique style 3.0mm wide filigree curved wedding band. The filigree has a simple yet elegant open work scrolled pattern. Features a 5.5mm round four split prong setting. 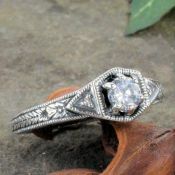 The filigree is intricate a with a trellis design that has embossed details all the way to the base of the band.